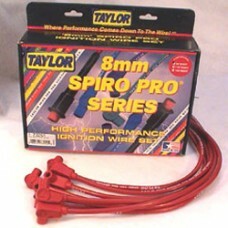 Taylor Spiro-Pro ignition wire set. These high performance wires feature spiral wound core to suppress radio interference, 8mm silicone inner and outer jacket (heat resistant up to 600 deg. F), silicone 90 degree silicone plug boots, fibreglass braid and a choice of distributor boots. Wires need to be cut and distributor ends connected. Can be used with MSD ignition. Colour: Red with 90 degree spark plug boots. Universal fit.